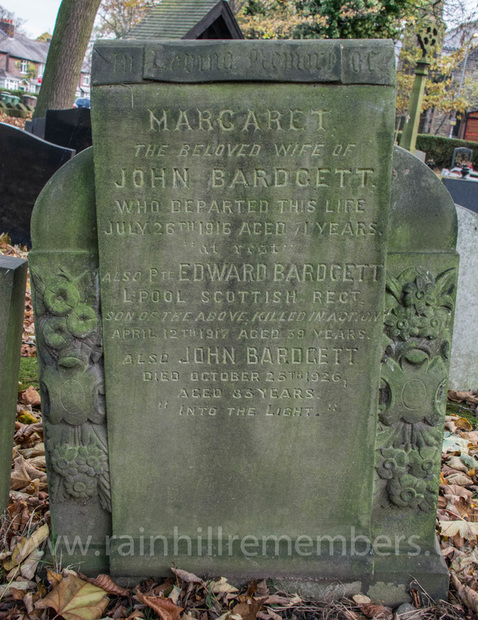 Edward Martin Bardgett was born in Rainhill in 1878. He was the eldest son of John, from Pooley Bridge and Margaret Bardgett, who in 1881 were living at Eccleston Terrace. Edward was 3 and his sister Margaret was 4 months old. Sometime between 1881 and 1891 the family moved to The North Lodge, Rainhill Asylum, where Margaret was the Lodge Keeper. By 1911, Edward was married to Nellie and they were living in Bury with their 2 year old son, John. Edward was listed as a general contracting building. Edward enlisted in the King’s Liverpool Regiment 1st/10th Battalion becoming soldier 358031 and was killed in action on 12th April 1917 aged 39. He is buried in Vlamertinghe Military Cemetery and remembered on the family grave in St. Ann’s Churchyard. The family grave of the Bardgett family in St. Ann's Churchyard.